This may have been the slowest episode of The 100 yet, but I’m not mad. The amount of plot that these writers need to fit into an hour episode is insanely daunting, and we are obviously building to one huge season finale. Plus, I have to applaud the writers for the very solid and plot-hole-less web they have been building in season four. “We Will Rise” starts off with Ilian getting beaten by a mob of angry Arkadians. Do you blame them? Kane appears, weapons blazing, to break up the fight. That leads to Ilian being sent to the med bay, under Octavia’s watchful eye. Ilian attempts to plead with her — he didn’t kill anyone and didn’t realize he doomed humanity. I have to side with Octavia here: this whole Ilian puppy dog routine is VERY annoying. Niyla realizes that Ilian’s guards are missing and immediately goes to tell someone. That someone is Monty, who then telephones the news to Jaha who doesn’t seem to really care. Monty then goes off to tell Kane, who rushes to lock down med bay. Bad news though: the mob of angry Arkadians are already pushing inside. It’s at this point that I transferred my anger from Ilian to Octavia as she pushes open the med bay doors to let the mob get Ilian. Kane attempts to protect him, but Miller’s dad shock-batons him. BETRAYAL! Octavia tells the mob that the kill is hers. The crowd drags Ilian to the execution area (where Lincoln was killed), while Octavia holds a gun to his head. This is not how Octavia kills, so I am super annoyed at this point. Monty pleads with Octavia to put down the gun, but the mob won’t have it. Luckily, Jaha sounds the black rain alarm and everyone runs inside. Kane tells Octavia this is exactly what Pike did to Lincoln and says, “You do this and you are no better than he was.” Octavia then proceeds to get flashbacks of Lincoln’s death and breaks down crying. She runs away through the gates. Jaha releases Ilian and runs in the same direction as Octavia. It’s all very dramatic. 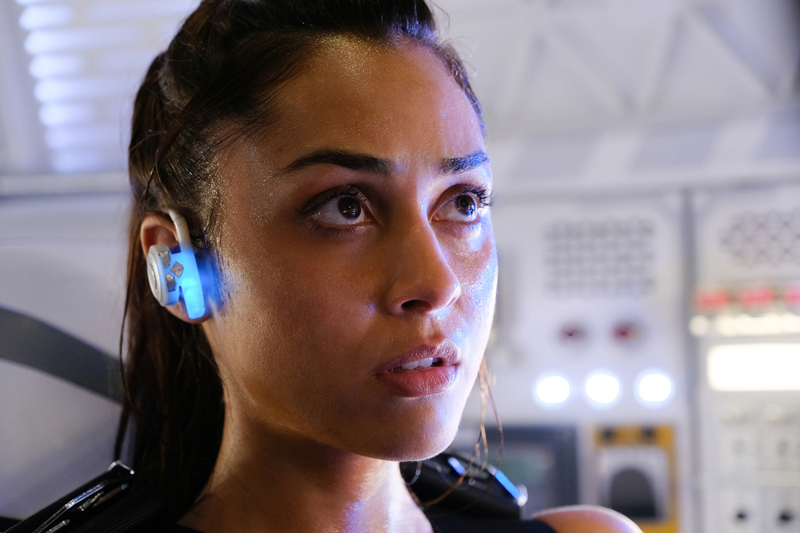 Storyline number two in the episode consists of Clarke, Bellamy, and Roan attempting to get the hydrazine to Raven so that she can make the nightblood in space. The problem? Well, there are only 10 barrels of hydrazine left available for all of humanity and losing even one barrel means they can’t save everyone. While driving, the crew runs into a bunch of Trikru warriors. Clarke goes to attend the wounded, but it turns out Azgeda burned down their village. The Trikru warriors ask for a lift, but Clarke denies their request, saying they aren’t going to Polis. Everything is fine... until a Trikru kid sees Roan and Azgeda warriors in the back of the caravan and everyone starts fighting. The rovers are able to get out in time, but then run into a stream that wasn’t there a few days ago. Roan says it’s ice melt. So he and Bellamy decide to go find another path. Problem #2: Bellamy and Roan lose contact with Clarke’s rover. The duo jets back to Clarke’s rover, only to find it missing. It turns out that Roan’s men betrayed him and are taking the hydrazine to Polis, because that’s useful. This leads to The 100’s version of a car chase with Bellamy driving, Roan jumping off the jeep onto Clarke’s jeep, while an Azgeda warrior attempts to throw off the explosive barrels. Bellamy then speeds his rover ahead, stops in front of Clarke’s oncoming rover, shoots the Azgeda warrior through the window (who has his knife to Clarke’s throat) and BOOM! Everyone lives. Problem #3: A Trikru arrow hit one of the barrels of hydrazine and they need every last drop. The good news? There was a very cute Bellarke moment, but apparently the two are splitting up again — one to the island and one back to Azgeda (Bellamy wants to talk to Octavia). Meanwhile, Raven is struggling through her spaceship simulations. She keeps running out of fake fuel and crashing. Murphy is her babysitter, and apparently makes one too many wisecracks because Raven starts insulting him. Luna hears the commotion and runs to the room to save him. Raven storms back to the simulator for attempt #29. Raven fails again, but Luna comes up with a plan — swim away. Murphy also suggests she flies the plane herself. The good news? Attempt #30 works! They can survive, and so can the nightblood. Bad news? Bellamy radios in and tells the group about the empty barrel that was hit by the arrow. This pushes Raven over the edge, and the episode ends with her having another seizure. STOP HURTING RAVEN. Find something better to do with your time, writers. Go deal with the Octavia problem or Illian problem. NOT RAVEN. Clarke and Niylah got it oooon. Clarke also ask Niylah to stay in Arkadia so that she will be one of the first people to get the antidote. The Blake sibling problems continue because Octavia blames Bellamy for Lincoln’s death — STILL. The #Bellarke moment in this episode was cute, but what was Bellamy going to say to Clarke? “If I don’t see you again…” Thanks for the interruption, Roan.